Zimbabwe People First (ZPF) leader Joice Mujuru yesterday savaged President Robert Mugabe for using violence to continue clinging onto power and called on the nonagenarian to resign and pave way for an early election. Addressing more than 5 000 supporters who thronged Sakubva Stadium for her ZPF’s maiden rally here, Mujuru said Mugabe should just concede failure and allow the country to move forward. “The reality we are facing is that the country has collapsed. … Mugabe should just announce that he has failed. It has failed me, people… he must not keep assaulting children. He should announce elections properly to allow whoever the people prefer to take over in peace,” Mujuru said to applause. The former vice president accused the Zanu PF government of being heavy-handed in dealing with growing dissent, which she said has risen to such levels because government has been ignoring people’s concerns for too long. “The reason people are protesting is because people have been saying things for a long time now, but government has not been listening,” Mujuru said. She slammed the police and military for their aggression in dealing with the protests currently rocking the country. “We are hearing that last week there are children who were bitten by police dogs and are in hospital, we saw women being assaulted… Is that what we want? No! What we know is that police keep peace and do not initiate hostilities. This is what we expect as People First,” Mujuru said. Mujuru urged the citizenry to continue to demand accountability from the leadership peacefully. “We want to engage our leaders so that they give us answers but not through setting dogs on the people or assaulting them with baton sticks. 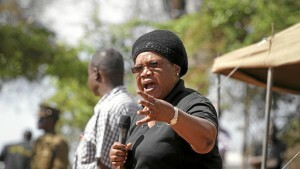 Police and the army are there to preserve peace, and we should also question in peace,” Mujuru said. Adding that it was sad that the country is now lagging behind countries that had less wealth due to bad economic policies. “As People First, we are saying in our country we cannot lag behind other countries that we know have less wealth than we have. We know that,” Mujuru said. “We should not just talk, are we registered voters? For those who are 17 or 18, do you understand what a ward is? Let’s know our ward set ups. This is where we will be cheated,” Mujuru said. She also urged traditional leaders to maintain their neutrality in elections, amid concerns they have been unwittingly and gradually drawn into the political fray by the ruling party, becoming agents of coercion for Zanu PF, contrary to their much-vaunted role as custodians of national culture and traditional values. “Let’s respect our traditional leaders. You are not politicians, don’t choose between children. Leave us to our political games but if you say so and so cannot participate in political activities, then you are no longer traditional leaders, you should then resign and join political ranks,” she said. Mujuru said she was driven to tears when she discovered the numbers of Zimbabweans who had skipped the country to South Africa. “I visited South Africa two weeks ago and I wept with what I discovered. It’s no place to go. Our children who went there and lost their identity documents or lost them and are giving birth there, do not have any identity. They are now being separated with their children. “In the event of deaths there are just unmarked graves. What are we going to do about this generation? Surely where are we as a country? “…we never expected that at this stage and after a gruelling liberation struggle, we will have people leaving the country to endure such torrid suffering.